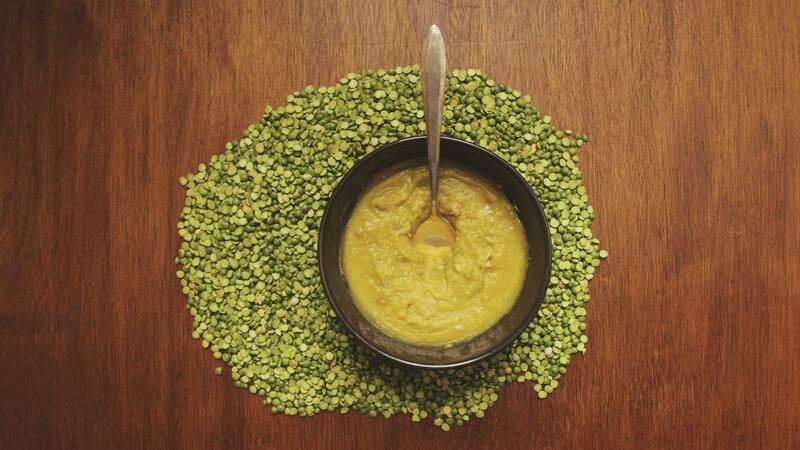 What Is a Recipe for Homemade Split Pea Soup? Ina Garten's recipe for Parker's Split Pea Soup calls for ingredients such as yellow onions, carrots, garlic, and dried green split peas. The recipe was featured on her Food Network show "Barefoot Contessa" and is available on FoodNetwork.com. Start by chopping 1 cup of yellow onion and mincing two cloves of peeled garlic. Add 1/8 cup of olive oil to a 4-quart stock pot over medium heat and add the onions and garlic along with 1/2 teaspoon of dried oregano, 1 teaspoon of kosher salt and 1 teaspoon of freshly ground black pepper. Saute for about 10 to 15 minutes until the onions become translucent. Add 2 cups of medium-diced carrots and 1 cup of medium-diced, unpeeled red potatoes to the pot along with 1/2 pound of dried split green peas and 8 cups of chicken stock. Bring the contents of the stock pot to a boil and simmer for 40 minutes without covering. Skim off any foam that rises to the top while stirring occasionally to prevent solids from sticking to the bottom of the pot. After 40 minutes, add another 1/2 pound of split green peas and continue to simmer for 40 more minutes. The soup is ready when all the peas are tender and soft. Season with kosher salt and freshly ground black pepper to taste before serving hot in individual bowls. What Is an Easy Recipe for Split Pea Soup? What Is an Easy Split Pea Soup Recipe? What Is an Easy Tomato Soup Recipe? How Do You Make Easy Mushroom Soup? What Is an Easy Cabbage Soup Recipe? What Is an Easy Recipe for Chicken Fried Rice? What Is a Recipe for Homemade Beef Barley Soup?